Just when William is ready to fall asleep in his cozy cabin, there is a tap on his window. A chilly chipmunk asks to stay, and Will scooches over in bed. "There's room for two--I'm sure we'll fit." The chipmunk is just the first in a parade of mammals, each bigger than the last, until the bed is full. Then a note is slipped beneath the door: "Do you have room for just one more?" William tugs the door to see who's there . . . only to find a great big BEAR! Is there enough space to spare? Will the other animals be willing to share? Kids will delight at each new guest's arrival and enjoy counting along as the animals keep scooching over to fit in William's bed. 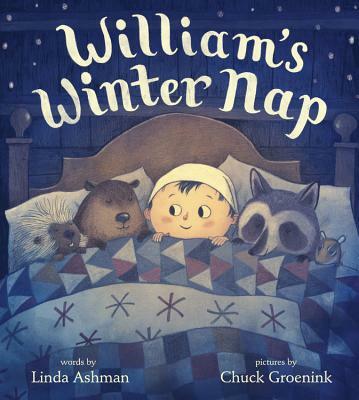 Linda Ashman's clever rhymes set up each page turn with suspense and humor, and the expressions on Chuck Groenink's characters are perfect. This is must reading for the dark time of year when everyone wants to hibernate! Linda Ashman (lindaashman.com) is the author of more than thirty picture books and the creator of The Nuts and Bolts Guide to Writing Picture Books. To her, a well-done picture book is a work of art. But, she says, "The real magic happens when a picture book is shared and a child laughs, asks questions, studies the illustrations, and says, 'Read it again.'" Her books have been included on the "best of the year" lists of The New York Times, Parenting and Child magazines, the New York Public Library, Bank Street College of Education, and the International Reading Association. She leads writing workshops and gives presentations about writing and children's books at conferences and schools. She lives in Chapel Hill, North Carolina with her husband, Jack, their son Jackson, and their two dogs.